Manchester University is giving away 1,000 children’s books in downtown North Manchester on Friday, Aug. 9 at FunFest By The River. The books, provided through a literacy partnership with Better World Books, span reading levels K-6. They’re all free at the MU booth on Market Street. From Where the Wild Things Are, to The Cat in the Hat and The Hungry Caterpillar, the mountain of books is a library of favorites and adventures in reading. Manchester’s partnership with Better World Books opens lots of opportunities to put books into the hands of the community’s youth, as well as adults. Each month, Better World will provide 100 books to MU to distribute in the community. Beneficiaries include scores of elementary students MU students tutor in area schools – 3,000 hours annually dedicated to improving reading comprehension and vocabulary. MU also leaves books in local doctors’ offices for children to take home. Adults also get the gently used books. At free community dinners hosted monthly by Zion Evangelical Lutheran Church, MU volunteers help serve and also give away literary classics, autobiographies and historical novels. The book giveaway dovetails with Manchester’s leadership in the President’s Interfaith and Community Service Campus Challenge – a partnership with local churches to improve the literacy rates in our community and combat the poverty level, said Miller-Patrick. Over the past year, Manchester University employees, students and neighbors have placed almost 11,000 books in a special Better World Books bin on campus. 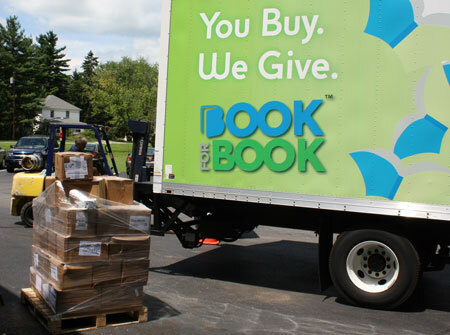 Better World collects and ships the books to communities around the world. It also sells them at extremely reduced prices in its Mishawaka, Ind., outlet store and recycles unusable or damaged books. All types of books are collected: textbooks, novels, storybooks, history books, encyclopedia sets, atlases … the topics are vast and fascinating to somebody, somewhere. Learn more about Better World Books at betterworldbooks.com. Community members are invited to drop their gently used books into the MU bin, located behind the Administration Building on College Avenue in North Manchester. Learn more about area service opportunities, projects and the campus chapter of Indiana Reading Corps at manchester.edu/OSD/CSO/Index.htm.